The new, higher-speed DDR4 DRAM generation gained significant marketshare in 2016, representing 45% of total DRAM sales. 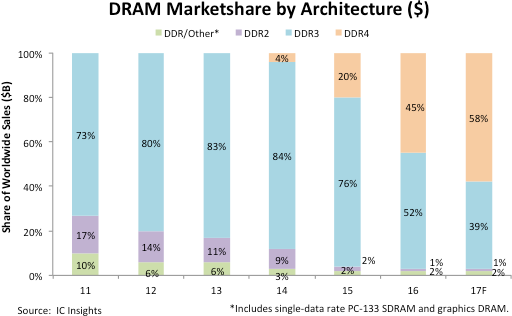 Previously, DDR3 DRAM, including low-power versions used in tablets, smartphones, and notebook PCs, accounted for 84% of total DRAM sales in 2014 and 76% in 2015, but in 2016, DDR4 price premiums evaporated and prices fell to nearly the same ASP as DDR3 DRAMs. A growing number of microprocessors, like Intel’s newest 14nm x86 Core processors, now contain DDR4 controllers and interfaces. As a result, IC Insights expects DDR4 to become the dominant DRAM generation in 2017 with 58% marketshare versus 39% for DDR3 (Figure 1). The Joint Electron Devices Engineering Council (JEDEC) officially launched the fourth generation of DDR in 2012. In 2014, DDR4 memories first began appearing on the market in DRAM modules for powerful servers and a small number of high-end desktop computers, which had souped-up motherboards or the “extreme” versions of Intel’s 22nm Haswell-E processors for high-performance gaming software and PC enthusiasts, but volume sales remained low until 2015, when data centers and Internet companies began loading up servers with the new-generation memories to increase performance and lower power consumption. In 2016, DDR4 memories quickly spread into more data center servers, mainframes, and high-end PCs, accounting for about 45% of total DRAM sales versus 20% in 2015. In 2017, DDR4 will move into more notebook PCs, high-end tablets, and smartphones and is expected to hold a 58% share of DRAM sales. The DDR4 standard contains a number of features that are expected to speed up memory operations and increase SDRAM storage in servers, notebook and desktop PCs, tablet computers, and a wide range of consumer electronics. The DDR4 standard supports stacked memory chips with up to eight devices presenting a single signal load to memory controllers. Compared to DDR3, DDR4 can potentially double the module density, double the speed, and lower power consumption up to 20%, thereby extending battery life in future 64-bit tablets and smartphones. Meanwhile, the DRAM average selling price has been increasing very rapidly since mid-2016. Figure 2 shows that the DRAM ASP increased 54% from $2.41 in April 2016 to $3.70 in February 2017. As a result of this big increase, IC Insights raised its 2017 DRAM market forecast to $57.3 billion, which is a 39% increase over 2016. IC Insights believes that DRAM ASPs will continue to trend upward through most of the first half of 2017, though probably not as rapidly as they did between the period from April 2016 to February 2017. In its latest quarterly financial conference call, Micron indicated its DRAM outlook through the balance of its fiscal year 2017 (ending August 31) was very encouraging, with solid demand coming from PC, server, communication, automotive, and several other applications. However, the bigger question for Micron and other top DRAM suppliers is available supply and whether (more accurately, when will) prices plateau and begin trending downward. One indication that DRAM prices could soften in the second half of the year is the fact that Samsung and SK Hynix are bringing additional DRAM capacity online that features smaller process geometries. Samsung is slated to begin operations at its new Fab 18, in Pyeongtaek, South Korea in 2Q17. Fab 18, with capacity of 300,000 300mm wafer starts per month, features five production lines that are dedicated primarily to making DRAM. The company plans to begin DRAM operations at the fab using an 18nm process technology. SK Hynix has transitioned most of its South Korean-based DRAM output from Fab M10 to Fab M14. With Fab M14 and its dedicated DRAM fab in Wuxi, China, SK Hynix has DRAM capacity of about 280,000 300mm wafer starts per month. SK Hynix is manufacturing most of its DRAM at the 21nm node, but expects to begin using sub 20nm process technology later this year, thereby helping to reduce costs and increase the number of chips on a wafer. Following a year of extraordinary gains in pricing, a boost to DRAM supply in the second half of 2017 could lead to reduced ASPs and the inevitable start of a cyclical slowdown in the DRAM market. Participating in the DRAM market has always been a big challenge for suppliers. Hot or cold, boom or bust—the DRAM market is rarely moving along in a steady, predictable manner. For at least the first half of 2017, it appears that DRAM market will be very favorable for these top three suppliers.